Wind blowing toward hills or ridges flows upward, over, and around the abrupt rises in terrain. The upward moving air creates lift which is sometimes excellent for soaring. Figure 168 is a schematic showing area of best lift. Ridge or hill soaring offers great sport to the sailplane pilot who accepts the challenge and can wait for proper wind and stability combinations. 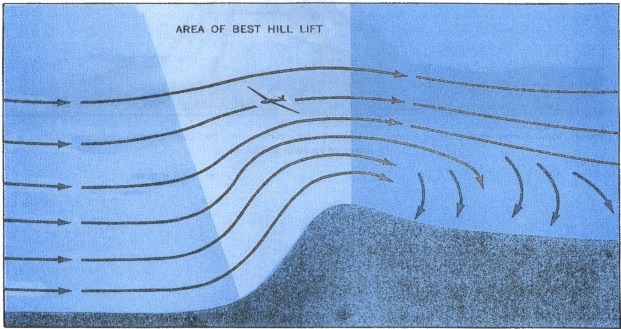 To create lift over hills or ridges, wind direction should be within about 30 to 40 degrees normal to the ridge line. A sustained speed of 15 knots or more usually generates enough lift to support a sailplane. Height of the lift usually is two or three times the height of the rise from the valley floor to the ridge crest. Strong winds tend to increase turbulence and low-level eddies without an appreciable increase in the height of the lift. Stability affects the continuity and extent of lift over hills or ridges. Stable air allows relatively streamlined upslope flow. A pilot experiences little or no turbulence in the steady, uniform area of best lift shown in figure 168. Since stable air tends to return to its original level, air spilling over the crest and downslope is churned into a snarl of leeside eddies, also shown in figure 168. Thus, stable air favors smooth lift but troublesome leeside low-altitude turbulence. When the airstream is moist and unstable, upslope lift may release the instability generating strong convective currents and cumulus clouds over windward slopes and hill crests. The initially laminar flow is broken up into convective cells. While the updrafts produce good lift, strong downdrafts may compromise low altitude flight over rough terrain. As with thermals, the lift will be transitory rather than smooth and uniform. Very gentle slopes provide little or no lift. Most favorable for soaring is a smooth, moderate slope. An ideal slope is about 1 to 4 which with an upslope wind of 15 knots creates lift of about 6 feet per second. With the same slope, a high-performance sailcraft with a sinking speed of 2 feet per second presumably could remain airborne with only a 5-knot wind! Very steep escarpments or rugged slopes induce turbulent eddies. Strong winds extend these eddies to a considerable height usually disrupting any potential lift. The turbulent eddies also enhance the possibility of a low-altitude upset. Ridges extending for several miles without abrupt breaks tend to provide uniform lift throughout their length. In contrast, a single peak diverts wind flow around the peak as well as over it and thus is less favorable for soaring. Figure 169 shows wind flow around an isolated peak. FIGURE 169. Strong winds flowing around an isolated peak produce little lift. During light winds, sunlit slopes may be a favored location for thermals. Some wind flow patterns over ridges and hills are illustrated in figure 170. Deviations from these patterns depend on wind direction and speed, on stability, on slope profile, and on general terrain roughness. FIGURE 170. Windflow over various types of terrain. The many deviations from these patterns depend on wind speed, slope profile, and terrain roughness. The soaring pilot, always alert, must remain especially so in seeking or riding hill lift. You may be able to spot indicators of good lift. Other clues may mark areas to avoid. When air is unstable, do not venture too near the slope. You can identify unstable air either by the updrafts and downdrafts in dry thermals or by cumulus building over hills or ridges. Approaching at too low an altitude may suddenly put you in a downdraft, forcing an inadvertent landing. When winds are strong, surface friction may create low-level eddies even over relatively smooth slopes. Also, friction may drastically reduce the effective wind speed near the surface. When climbing at low altitude toward a slope under these conditions, be prepared to turn quickly toward the valley in event you lose lift. Renew your attempt to climb farther from the hill. If winds are weak, you may find lift only very near the sloping surface. Then you must “hug” the slope to find needed lift. However, avoid this procedure if there are indications of up and down drafts. In general, for any given slope, keep your distance from the slope proportional to wind speed. Leeward of hills and ridges is an area where wind is blocked by the obstruction. Among soaring circles this area is called the “wind shadow.” In the wind shadow, downdrafts predominate as shown in figure 168. If you stray into the wind shadow at an altitude near or below the altitude of the ridge crest, you may be embarrassed by an unscheduled and possibly rough landing. Try to stay within the area of best lift shown in figure 168.